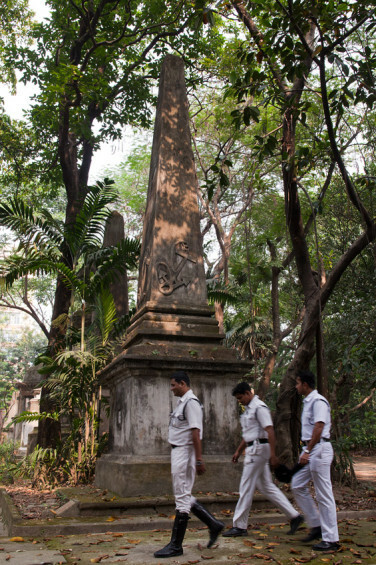 Kolkata’s South Park Street Cemetery, with its 18th and 19th century monolithic tombs, is full of the tales and tribulations of Britain’s earliest pioneers. 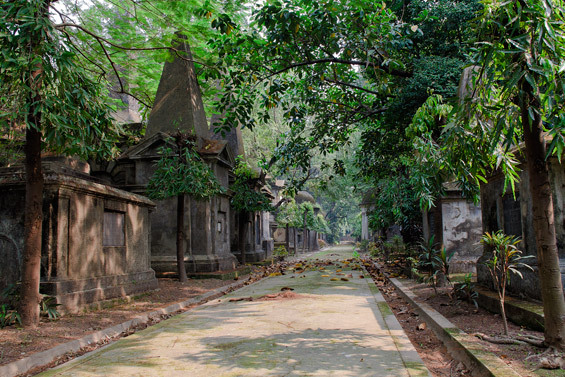 I turned into the last avenue in the graveyard, it was darker here, the air damp and uncharacteristically cool for Kolkata. 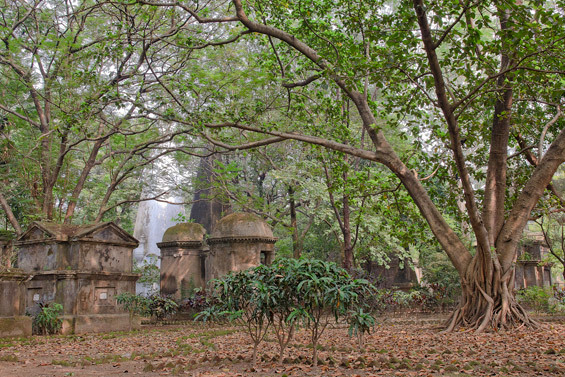 Outside the twenty foot high mossy stone wall enclosure, the relentless drone of Kolkata’s traffic stopped. A raggedy crow hopped across my path. My footsteps slowed to a funereal pace as I waded through the shadows and memories of lives put to rest in this silent corner of the cemetery. The jungle was thick, allowing no direct sunlight to penetrate through the nest of branches into the city of mausoleums huddled together deep inside its shadows. India was filled with danger for its settlers, and tropical disease was a common cause of death for many of them. 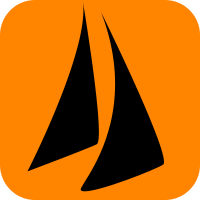 Soldiers died in relentless skirmishes and shipwrecks took the lives of many mariners. Nevertheless, enough of them thrived (or were replaced) to oversee the original three villages gradually turn into The British Raj’s great nineteenth century metropolis, Calcutta. We walked the length of Park Street, admiring the juxtaposition of colonial and modern architecture, dicing with death as we crossed and re-crossed the road, until we reached the South Park Street Cemetery. 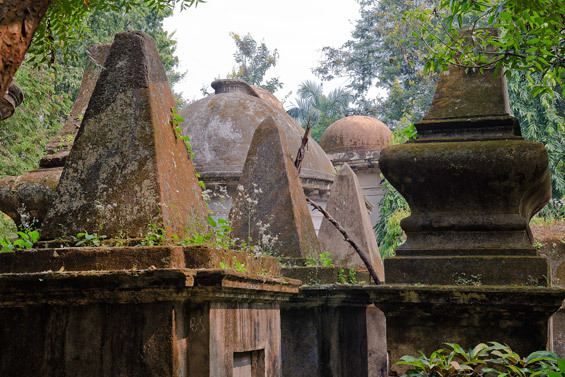 Built in 1767 for the early East India Company pioneers and their attendants, this latter day necropolis is packed with giant mausoleums, all vying for top billing: pyramids, colonnaded temples, oversized urns, obelisks, sarcophagi and stone cupolas. The cemetery is a roll-call of the soldiers, sailors, civil servants, merchants, women and children who succumbed to the rigours of an unfamiliar and disease-ridden life in the tropics. I felt nostalgia for a time I had never known. One hundred and fourteen years before I arrived there, Sir William Wilson Hunter’s eloquent words summed up the oppression which descended on me as I walked between the tombs. “Most mournful of graveyards are those walled-up ghastly settlements, desolate spaces of brick ruins, and blotched plaster, reproachful of forgetfulness and neglect. It was difficult to restrain some retrospective pity for the inmates of those squalid tenements — for their hard, hot lives more than a hundred years ago, solaced by none of the alleviations which have become necessaries of our modern Indian existence; with few airy verandahs or lofty ceilings, without punkahs, without ice, without possibilities of change to the hills, or respite to their exile by visits home. There were not many visitors to the cemetery on the day we went, but then you do have to make a particular effort to go there, it is not a place that you pass on the way to anywhere else. We bumped into one other western tourist, a few Indian couples and a small group of Indian soldiers during the two hours we spent there. But we were never alone, the caw-cawing of a hundred flapping crows accompanied us over the whole eight acres. The cemetery — along with its counterpart on the other side of the road, which is no longer with us — was built on marshy land, outside the central part of the city. 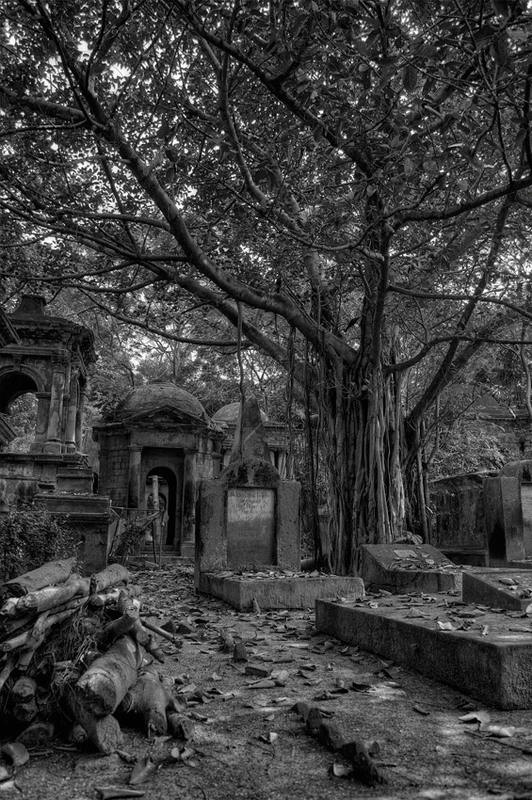 It was a long walk from church to graveyard through the jungle, where the spectre of death was kept away from the sensitive eyes of Kolkata’s residents. Jamie and I quickly split up when we entered, Jamie looking for the perfect angle and lighting conditions, while I dawdled among the monoliths. I read the prosaic British names on the oversized tombs, all of them a long way from home: Elizabeth Jane Barwell, James Addison Webster, Captain Dennis Bodkin, Harriet Chicheley Plowden, Major George Dowlie, Thomas Cotterell, Capt W Mackay. Near the entrance, and smothered in the edible scent from a curry leaf tree, lies Hastings Impey Esq, “son of Sir Elijah Impey, Factor in the Service of the Eaft India Company who died in the 24th year of his Age February 4th 1805″. 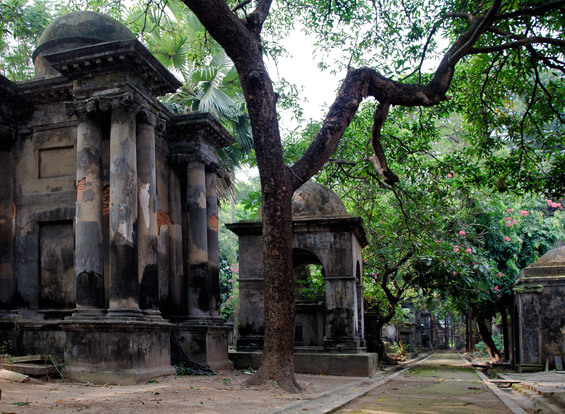 His father — the most prominent name on the stone, and former Chief Justice of Bengal — fared rather better than his son. He left India and became the parliamentary member for New Romney, before retiring to Brighton. In 1809 he died, and was buried in the family vault in Hammersmith. Now and again I strayed off the paths to clear creepers away for a closer look at the moss covered graves. 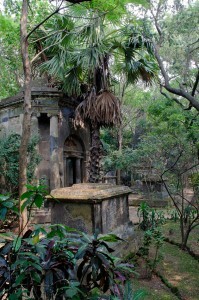 Much of the cemetery was overgrown, and many of the tombs are decaying: inscriptions no longer legible, corners falling off and columns crumbling. 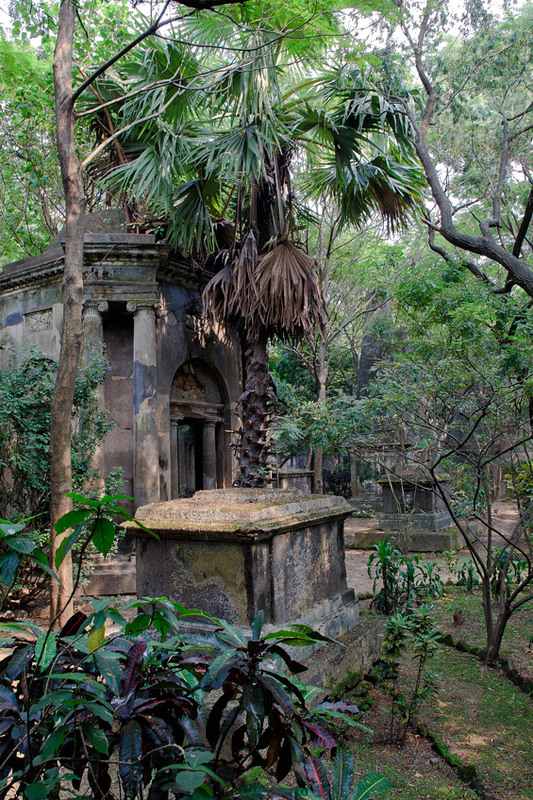 Someone is keeping the jungle at bay, though, because the pathways were reasonably clear and at over 250 years old the tombs would have been swallowed up without some attention. As I read each new story in the names, ages, dedications and tomb designs, I became increasingly reminded of the bravery and stoicism shown by these settlers. The journey alone would have been a hardship, and then to end up in such inhospitable and unknown terrain would have been an even greater trial, especially for women in their layers of clothes and corsetry. For all their jingoism and arrogance, I felt humbled by their intrepidness. We call ourselves travellers today, but catching a flight over to the other side of the world for a quick jaunt up to Machu Picchu, or a guided tour round a wildlife park, doesn’t compare to the terrifying adventure into the unknown these individuals must have endured for the sake of commerce. As I slowly made my way along the crumbling path of the darkest part of the cemetery,a croaking frog broke through the silence. Something slithered underneath the damp leaves, and bird-sized insects thrummed and fanned my face as they lazily flew by. 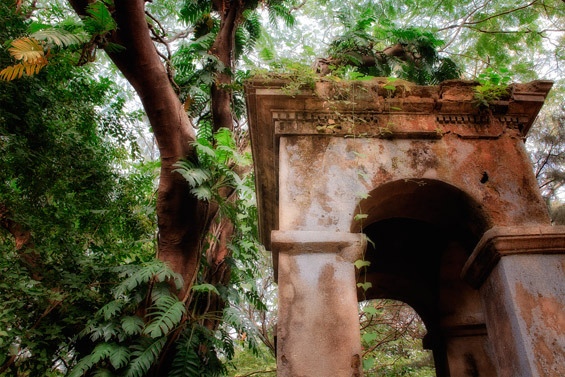 Indian squirrels danced among the ruins, and lizards — sunbathing in the few rays of light which had pierced the latticework of branches — crawled under broken stones. Murderous crows watched me with intelligent, soulless eyes, calling and laughing at each other, glad to see the back of me. The marshy land in this neglected corner of death was very much alive, and despite the best efforts of the graveyard’s wardens was slowly reclaiming itself. 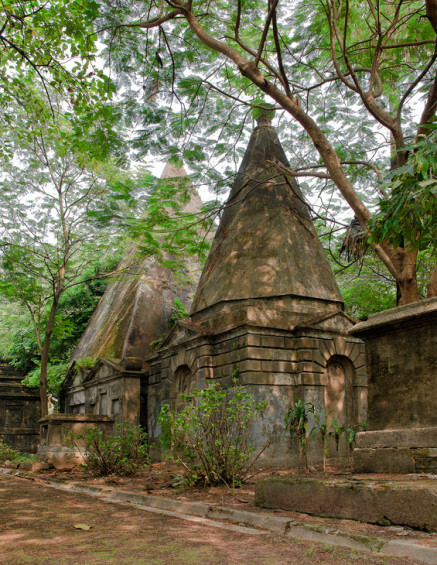 Have you ever come across a cemetery in your travels which has moved, amazed or confounded you? 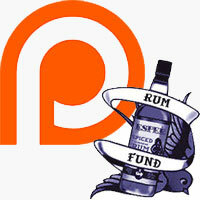 Send us a comment if you have! Glad you came along for the walk, Tony! A good piece of descriptive writing, Liz. I have not travelled far to find a cemetery of great interest, this being “The Victorian Cemetery at Histon, Cambridge”. It was designed by J C Loudon in 1843 as a model for public health and hygiene. There are some wonderful Victorian headstones, many ornately carved, Different trees and plants flourish and it is full of wildlife. At the entrance there is a Grade 11 listed lodge flanked by 2 pairs of cast iron gates. The Victorians were encouraged to visit for a family day out and picnic in the grounds. Now the cemetery is a very peaceful place to wander round. Our hobby is Genealogy, so Mike and I get great pleasure in visiting grave yards, particularly if we have a headstone of an ancestor to find, with valuable information inscribed thereon. My most exciting find was the row of 12 ancestor’s headstones from the 18th and 19th Centuries, set in a beautiful Oxfordshire countryside cemetery. The peace of that place was shattered by my cries of delight! Thanks Les! Interesting information on the Histon cemetery in Cambridge. I’ll add it to my list.